ALLBIDS is hosting the antique auction you don’t want to miss, including this Chinese Famille Rose Buddhist Lions Vase. If you have an eye for Asian design, rare antiques or other collectibles, you won’t want to miss this rare opportunity to browse and purchase some unique wares from the estate of Cook resident and one of Canberra’s most prominent and passionate collectors, John Maxfield, an Audiologist who was also well renowned in the art scene in Melbourne in the late 1960s. 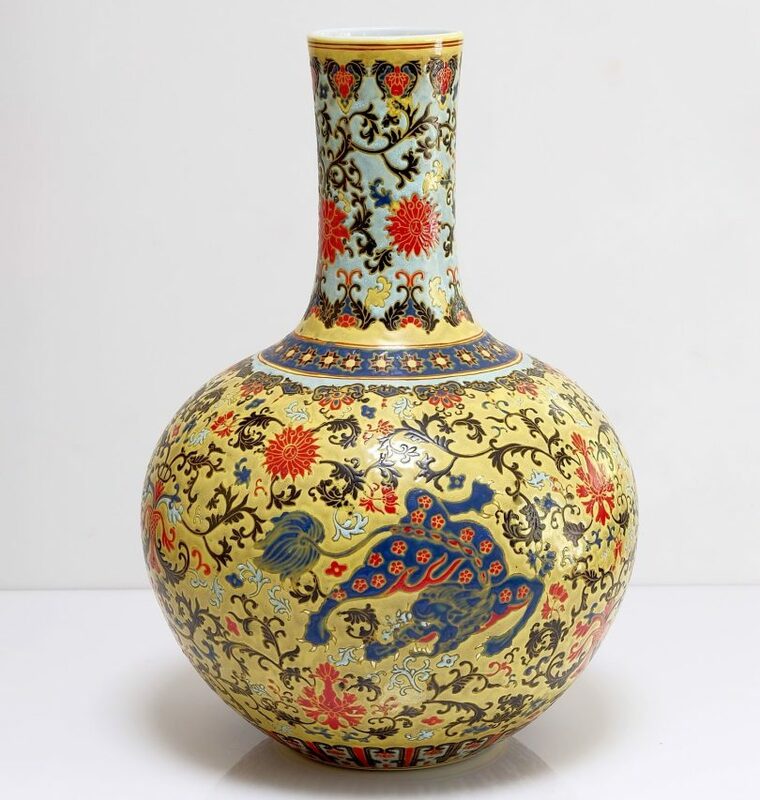 In one of the largest and most exclusive estate auctions in Canberra’s history, the large collection of Chinese and other antiques, fine art, household and garden items will be auctioned and sold unreserved over two nights, online on Canberra’s home-grown online auction site, ALLBIDS with items remaining in situ at the Cook residence. It’s hard not to be impressed with the vast collection of nearly 350 items which includes a wide range of decorative and household pieces, largely featuring various Chinese, Japanese and other Asian designs. Including a wide variety of unique artworks, vases, crystal and glassware, votives, candlestick holders and flatware, you never know what gem you may find. If you’re in the market for a vintage crockery set, choose between the collection of Royal Copenhagen Dinnerware, the Royal Doulton Yorktown China Dinner Service, or the collection of Japanese Fukagawa Fine Porcelain. 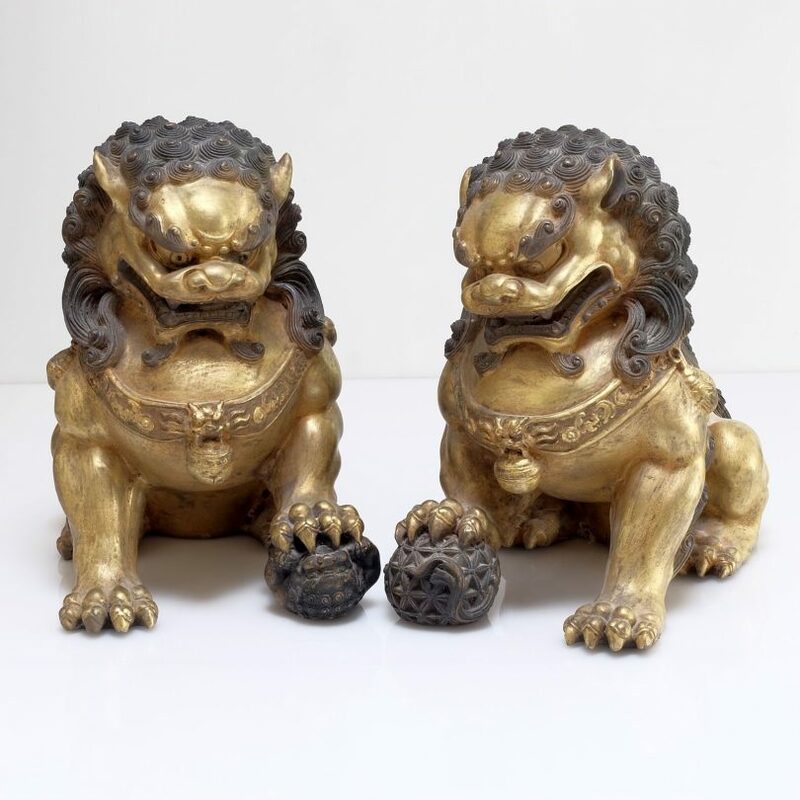 Pair of Chinese Gilt Bronze Buddhist Lions going to auction as part of the estate sale. Maybe you are a fan of Asian ceramic pots and vases and would be more interested in a Japanese Kutani Vase and Fukagawa Bowl, a Chinese Peach Bloom Vase, or a pair of Chinese Coral Red Decorated Jars on Rosewood stands. Or if Italian style is more up your alley, maybe the Valentino lamp base will pique your interest. But why settle for one, when you could have a matching pair of Valentino lamp bases? 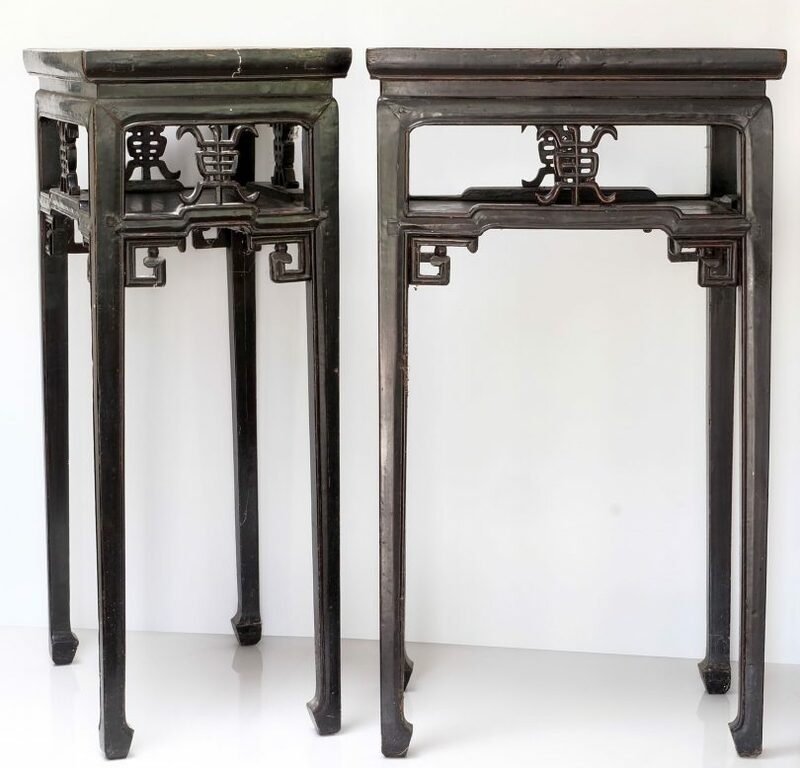 A pair of Chinese black lacquer stands which is set to sell on the 16th November. The collection also encompasses a wide range of hard-to-find furniture pieces, including various chests, drawers, dressers, stools, and tables, but the real show stopper is the large selection of Chinese sideboards and cabinets which are sure to impress. If you’re keen to step your garden style up a notch, the collection also includes a huge range of stone and terracotta pots, planters, urns, stands, and pedestals, as well as various lanterns, water fountains, outdoor furniture, decorative sculptures, statues, figures and ornate garden features. However, don’t despair if garden items or decorative collector’s pieces aren’t really your thing, as the collection even includes some more practical household items you might be looking for like a Sony Bravia LED TV, Fisher and Paykel front load washing machine, Simpson dryer, Fisher and Paykel fridge and LG microwave. You need to act quickly as all the items in this rare and unique collection will be auctioned online on the ALLBIDS website over two nights with all items to be picked up from estate residence at Cook, with the garden statuary, pots and outdoor auctions closing on Wednesday 15th November and auctions for all antiques, art and household goods finishing up on Thursday 16th November. With items set to sell for as little as $1, you’d be crazy not to have a look. View the full collection on the ALLBIDS website to find your newest treasure now!